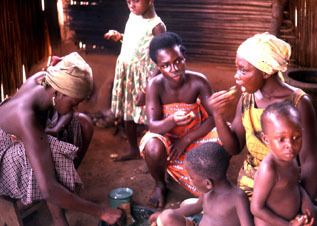 Men tend to eat with other men, while women usually eat with each other and children. When a husband and wife live in separate households (duolocally) in the same town (which is common when they go to their home town for funerals, or when a man has more than one wife), then you can see the pattern of children going from Mom's house to Dad's house, carrying supper. This is discussed in the paper, Covert Gynocracy. 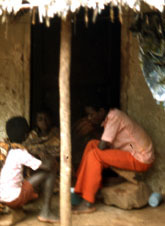 Husbands and wives may live together when away from the home town, but each go to their separate matrilineage homes to sleep when in the home town. This brings about the classical picture of children going from mama's house to papa's house each evening carrying a meal. If it is the wife's turn to stay with the husband (perhaps he has more than one wife), then she will prepare food at her house and take it over to him for the evening. The Akan prefer their meals to be cooked. The idea of eating a salad with a meal is considered to be deviant behaviour. Only animals, not humans, would eat raw meals. Desserts to end meals are unknown. During the day, apart from meal times, raw fresh fruit is eaten, most popularly oranges and bananas which are often sold where travellers change vehicles, ie lorry parks. Pineapple, "apple" (sour sap), "pear" (avocado), and various tropical fruits and berries are also eaten other than at meal times. In lorry parks, other between meal travelling snacks are often sold, these include boiled eggs, tea bread or sugar bread. Different European influences meant different vernacular names for bread, which is not an indigenous food. 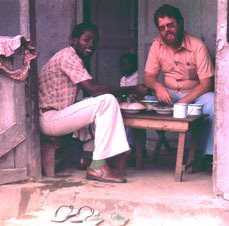 At Cape Coast, bread is "pannu" while in Kwawu, because the German Swiss influence, it is called "bodo." When someone leaves the village for a trek of several days, a common form of the good bye greeting is, "To bodo bre me," (Buy me bread). To say "good bye" is to "kra" someone, the same word as "kra" the destiny soul given to each person on the day s/he is born, when God will give the new born its "kra" gift of a destiny along with its first breath. See Three Souls. 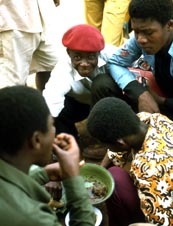 In the morning, a common meal is a porridge made from one of several alternatives, rice, roasted cassava, sorghum and various flours and meals. A favourite breakfast, but a bit more costly, is dokonu (kenkey), made from steamed fermented corn meal, along with an uncooked sauce made of grinding tomatoes, chilli peppers and onions in an mpayewa. It is eaten with smoked or fried fish or with tinned sardines. I asked why the sauce was made of raw vegetables instead of being cooked and was told that the preparing of the the sauce in an mpayewa substituted for cooking and the hot sauce was not considered to be raw (hot picante or spicy, not hot caliente or by temperature). Gari is made by grinding then roasting cassava. Often it is boiled and squeezed before roasting to remove the cyanide poison that is in the centre string of some varieties of cassava. It is jokingly called "bachelor food," because to prepare it one simply pours a bit of boiled water over it. 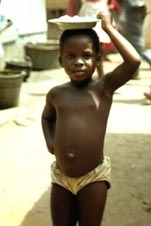 It can be eaten like that or a bit of stew, most popularly beans and oil, may be added.